The Habtoor Grand 5 Star Beach Resort & Spa Jumeirah Beach Hotel, Dubai Situated on Dubai's World-famous Jumeirah Beach and adjacent to the magnificent Dubai Marina, the Habtoor Grand Beach Resort & Spa Dubai, a member of Preferred Hotels & Resorts, occupies one of Dubai's most enchanting beachside locations. 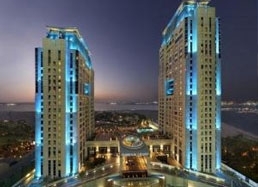 Perfect for both business and leisure travellers, this luxury Hotel in Jumeirah Beach is within a 30-minute drive from Dubai Airport and is in close proximity to Dubai Internet City, Dubai Media City and Shopping Malls. Pools, restaurants and bars are set amidst the hotel's tropical gardens. The 5 star resort in Dubai is a paradise of perfect vistas, where lush landscapes meet the warm Arabian Gulf, fringed by an immaculate beach and embraced by clear blue skies.